Documentation: Specimen: UNSM ZM10828, 19 May 1910 Child’s Point, Sarpy Co. This species tends to be a later migrant than many other warbler species. Migration takes place in May and early Jun, although there is an earlier report 25 Apr 1936 Logan Co, and later reports 12 Jun 1965 Douglas-Sarpy Cos, 15 Jun 1997 female Buffalo Co (Brogie 1998), 16 Jun 1992 Douglas-Sarpy Cos (Grzybowski 1992), 17 Jun 2005 Hastings, Adams Co, 17 Jun 1973 Keith Co, and 19 Jun 1964 Douglas-Sarpy Cos (see Comments). There are 18 reports from the Panhandle, all but one since 1973 (see Comments) and all in the period 13-31 May except for later reports 5 Jun 2005 Ash Hollow SHP, Garden Co and 17 Jun 1973 Scotts Bluff Co.
High counts: 20+ at Walnut Grove Park, Omaha 23 May 2008, 7 in Dakota Co 17 May 1997, 6 at Hormel Park, Fremont, Dodge Co 16 May 1999, and 6 in Sarpy Co 14 May 2011. A total of 101 were reported in 2018, 45 in 2008, and 31 in 2011. Migration is from late Aug through early Oct, with later reports 17 Oct 2017 Sarpy Co, and 26 Oct 1964 Lincoln Co. The only Panhandle records are 2 Sep 2001 Crescent Lake NWR, Garden Co, 2 Sep 2013 Chadron SP, Dawes Co, 3 Sep 2013 banded Chadron SP, 3 Sep 2017 one photographed Sowbelly Canyon, Sioux Co, 9 Sep 2006 Wind Springs Ranch, Sioux Co, 13 Sep 1997 North Platte NWR, Scotts Bluff Co, 17 Sep 1997 Scotts Bluff Co, and an immature photographed 29 Sep 2012 at Wind Springs Ranch. 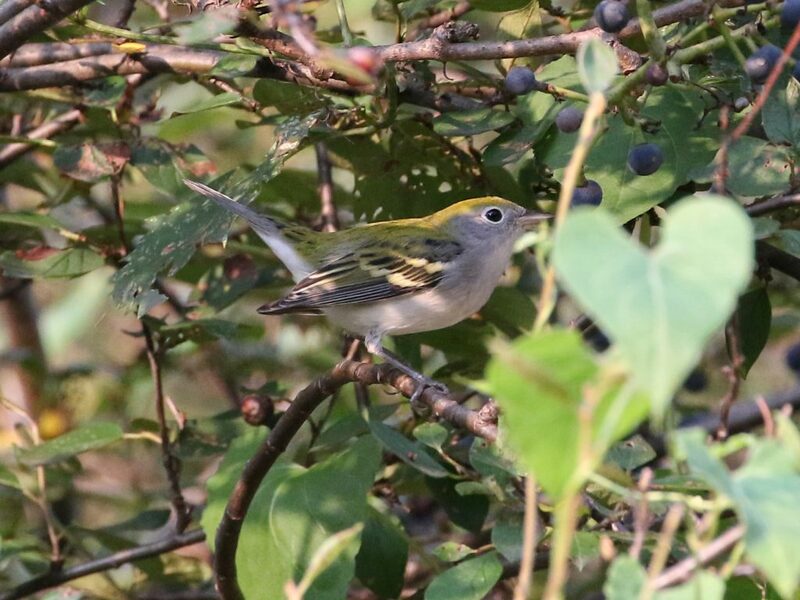 Chestnut-sided Warbler at Papiillion, Sarpy Co 21 Aug 2018. Photo by Phil Swanson. Comments: There are two published reports of breeding, but neither is convincingly documented. Trostler was said to have collected a set of eggs near Omaha 23 Jun 1894, at which time this species was “frequently seen throughout summer” (Bruner et al 1904). These eggs apparently do not now exist, and there have been no reports of summering birds since that time, although “young” were reported in Scotts Bluff Co in 1975 (Bennett 1976). No further details were provided. A small population established in the South Dakota Black Hills in 1997 and has continued since (Drilling et al 2018); as noted above (see Spring), spring Panhandle records are all since 1973. Photograph (top) of a Chestnut-sided Warbler at Papillion, Sarpy Co 13 May 2016 by Phil Swanson.